State House Phoenix-The Republican-led budget process in Arizona is chaotic – late-night hearings; massive, last-minute amendments; scheduling delays; and an overall lack of transparency. Unfortunately, this has become business as usual at the Capitol, so House Democrats were more than prepared to fight for your priorities and be your voice here. We brought ideas to the table and were ready to negotiate. Months ago, Republican leaders promised voters that Prop 123, the proposed settlement in the public school inflation funding lawsuit, would be the “first step” in getting money back into classrooms. 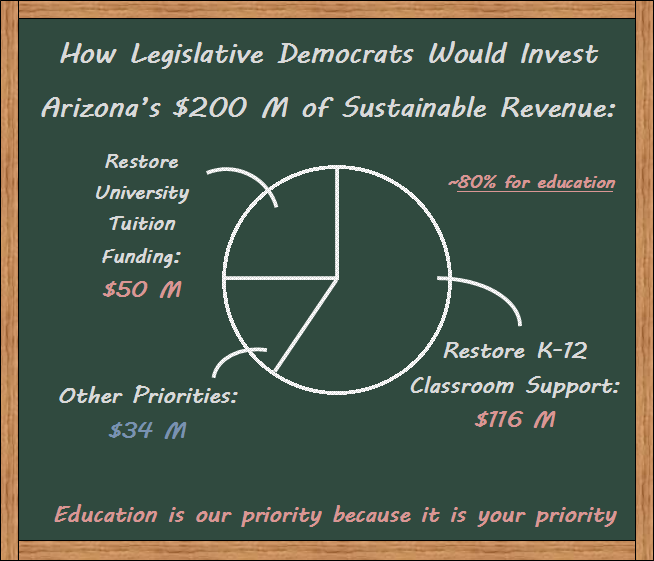 House Democrats have always prioritized education, and we knew that Arizona needed a second step that would increase the state’s investment in public education. Democrats found a way to do that while keeping the budget balanced and without raising taxes. 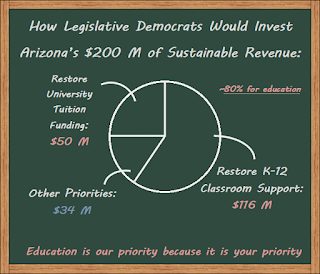 We pushed for the restoration of $116 million specifically for classroom resources. When the Republicans released their budget, House Democrats tried to incorporate our proposals. They ignored our plan for what seems like purely ideological reasons and protected the status quo of growing classroom sizes and using out-of-date textbooks and technology for our students. So the Republicans’ second step for education funding is not a step forward. House Democrats also worked to stop Republicans from making it more difficult for districts to build new schools, which would likely result in more crowded classrooms. At the same time, we budgeted an additional $50 million for state universities to stop the rising cost of tuition. And we tried to prevent Republicans from spending $5 million on Koch brother propaganda centers, called “economic freedom schools,” especially because the founding director of one of these centers has stated he wants to “get rid of public schools.” The Legislature should not spend tax dollars to advocate for the privatization of public schools when the Arizona Constitution mandates that the Legislature should provide for the maintenance of public schools and that universities should be as “nearly free” as possible. 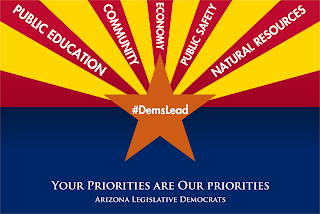 In addition to fighting for our public schools, Democrats wanted to strengthen our communities by restoring resources and preventative services to keep families out of crisis and out of the Department of Child Safety system. We wanted to restore child care subsidies for low-income, working families and the 24-month cap on the Temporary Assistance for Needy Families program, which helps Arizona’s neediest families put food on the table. Most states offer this program for up to five years but currently, in Arizona families are kicked can only receive help for 12 months. Democrats also stood up for KidsCare, which would provide health insurance for the more than 30,000 Arizona kids and would put about $75 million into the economy. But Republicans rejected this effort; some even avoided the vote on the issue all together. Our budget is a statement of priorities. And once again, the Republicans have indicated that they prioritize private prisons, which are getting a shot at a contract for an additional 1,000 beds, and tax cuts for wealthy special interests over our communities, our students and our future. There is a better way forward, and Arizona House Democrats will continue to reform, restore and reinvest in the priorities that will strengthen our state.